Today, Waterbear is in its 13th week and nearing the end of the first trimester! Since our last post, we had an appointment with the OBGYN/Midwifery clinic nearby. It was the first time I’d visited the actual clinic since all of the appointments to date have been at the hospital, about 30 minutes from our place. The clinic is maybe 5-10 minutes down the road so its very convenient for routine appointments. This appointment was set for March 1st. I really enjoyed my midwife, Olivia, at this appointment. We are very lucky to have a hospital in our area that offers a birthing center inside of the hospital. I’m opting to go for a natural birth and if anything complex arrises, I’ll be able to have an OBGYN nearby as well as an NICU and emergency C-section room down the hallway. As far as prenatal appointments go, I’m currently on a rotation where I will meet and work with all of the midwives so that when baby is ready for delivery, I’ll have at least met the midwife on duty at the hospital a minimum of one time. If anything were to put me into a high-risk category, I’d start seeing the OBGYN on staff in place of a midwife. So, this appointment, I had a physical exam (pelvic and breast), then had a quick test for gonorrhea/chlamydia, took my blood pressure, weight, urine test and a blood draw to measure my thyroid levels now that I’m taking a medication for that. At my appointment, my blood pressure measured well and I rang in at 126lbs, up 3lbs from my first appointment a few weeks ago. We also found the heartbeat on the doppler and listened in to a healthy heartbeat, still ticking along. My thyroid tests came back with the result of a normal range for my thyroid so it looks as though I’m able to stay on my current dosage of medication and wait a month or two before having my next draw, which is nice. All of my other routine tests/exams came back either negative or in normative range. On the way to the hospital to see Baby Nelson for the second time! Last week, we visited the hospital to see Waterbear on the “big screen” for our genetic testing opt-in and “First Trimester Screen”. Waterbear was measuring a bit ahead of its’ projected age, meaning that Waterbear measured at 13 weeks old on Thursday, March 10 (ahead of its projected date to turn 13 weeks of Saturday, March 12). On this day, Waterbear’s heartbeat was 150bpm and it measured 6.67cm from crown-to-rump. My weight rang in right on track for end-of-first trimester weight gain, at 128.6 lbs. I’ve read around the internet that weight gain (for those at a heathy BMI pre-baby) goes something like 5lbs in the first trimester and 1lb each week thereafter for a total of around 25-35lbs. Profile photo, and giving us a little wave, measuring crown to rump! At the ultrasound session, the tech measured baby’s nuchal translucency in the back of baby’s neck and checked for a nose bone. We were told that these two main components are checked for risk of chromosomal abnormalities in the ultrasound portion, however, since we were there, we checked for heart, brain, feet, hands, toes, nose, eyes and size of head. 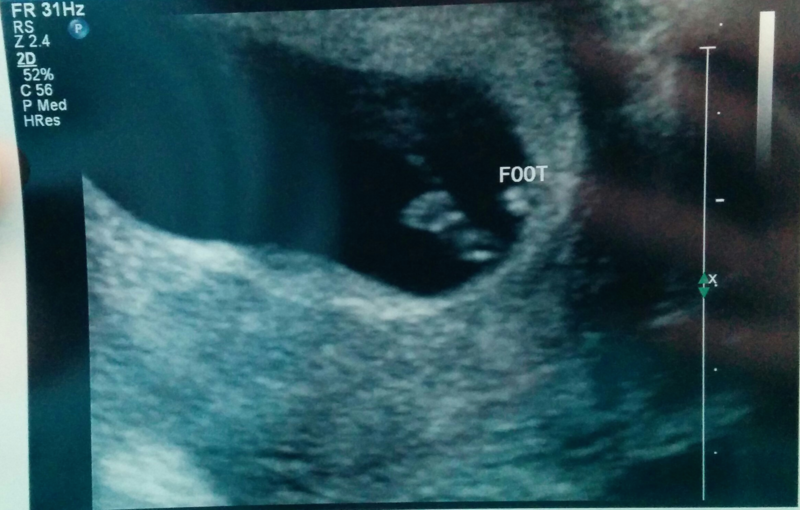 We were so surprised to see how much baby had grown since our last peanut-sized ultrasound. 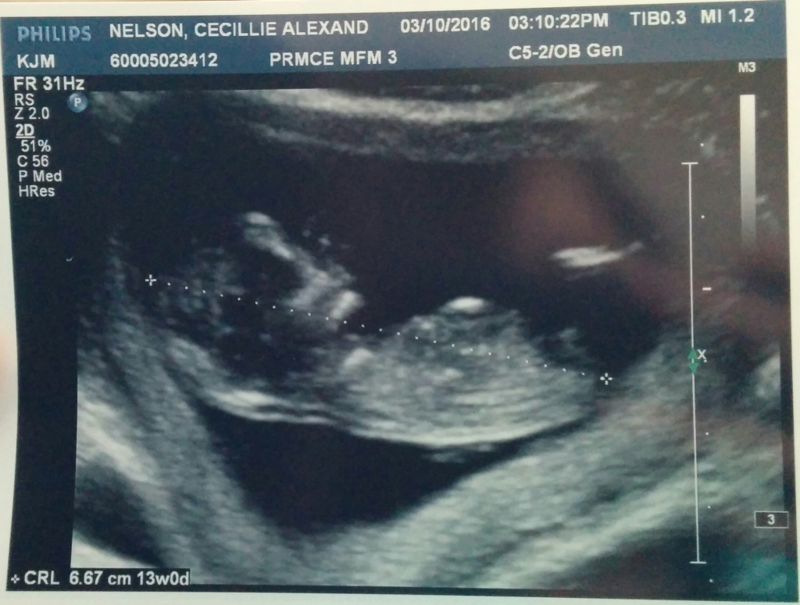 The ultrasound tech let me know that my placenta was technically above the baby, and as a result, I may not feel movement until later in my pregnancy. Essentially, baby would have to make a movement powerful enough to reverberate through the placenta before I could feel it. In spite of not feeling a thing so far, there is plenty of movement! 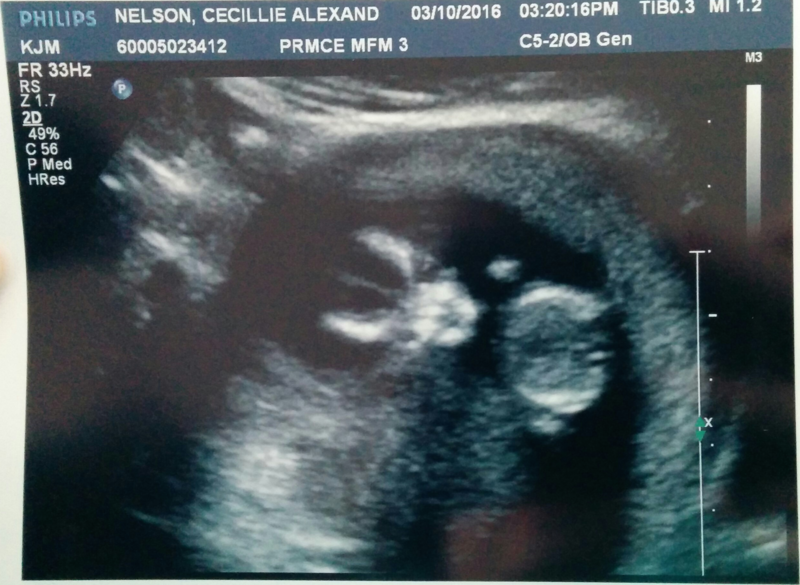 Baby was very wiggly and definitely suspected the ultrasound wand nearby after a few minutes. I tried to turn and move a bit to see if Waterbear would give us another side profile, but once it suspected the ultrasound wand, it was focused! Baby Nelson trying to figure out the ultrasound wand. Overall, Waterbear gave us a great show, doing a few rolls, showing us feet and a little walnut-like brain and even striking a little ninja pose. 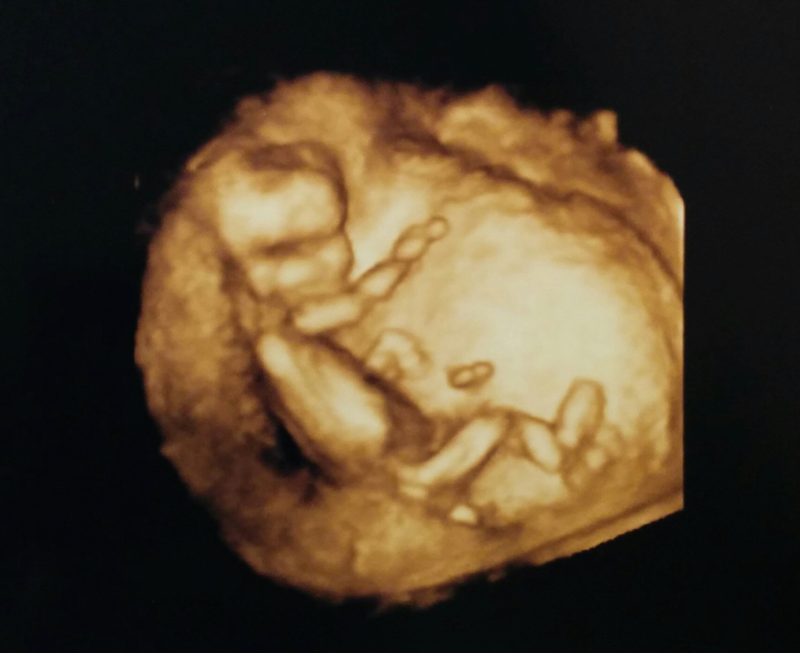 The ultrasound tech caught a 3D photo of the martial arts demo. It is hard to believe, as big as Waterbear looked on screen, that it is only about the size of a lime at the time we saw him/her. There wasn’t enough to tell whether Waterbear is a little girl or a little boy yet, so we will have to wait until our next scheduled ultrasound on May 5. Baby struck a ninja pose for its second on-screen debut. After the ultrasound and blood draw for genetic testing, James and I grabbed a bite to eat at a local Chinese restaurant. I ordered an authentic sweet and sour chicken dish with salad and rice while he feasted on a White Dragon roll and Bulgogi. After this, we had our official hospital tour. 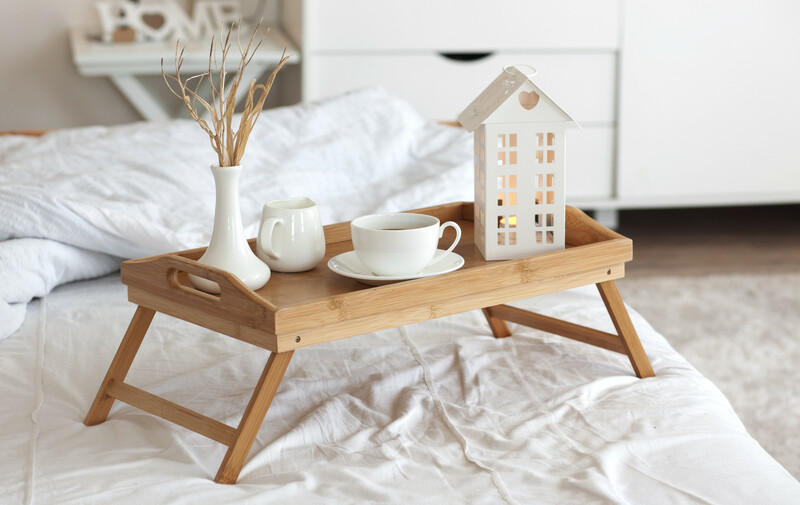 We found out a lot of useful information about time spent in the hospital for uncomplicated and complicated birthing scenarios, services and were able to see a sample room where baby will be born. There were a lot of features I liked including a bath tub, birthing bar, lactation specialist visit right after birth, and that baby stays in the room with parents for the entire duration after birth (if baby needed NICU, parents are encouraged to go with baby to help speed along recovery). A few days after the genetic testing appointment, we received notice that all of our tests came back within a normal range and we are not at an increased risk for Waterbear to have chromosomal abnormalities. It is important to note that everyone is at some chance of a risk, but parents are not given further genetic counseling unless baby tests for an increased risk. If I’m reading my results correctly, Waterbear’s chances of Downs Syndrome are 1 in 1130 and chances of Trisomy 18 are 1 in 21500. The nurse told us essentially that if we receive a call, we’re at an increased risk; If not, we’ll get a letter in the mail and chat about it at the next appointment. So, we were relieved for a quiet phone, but like I said to the genetic counselor, I would love the baby just the same. On top of all of the big baby updates, this month is our family’s health month! James recently got a vision update for his glasses prescription, as well as contacts. Last, week we picked up his new glasses and they’re fitting well so far. This week, he is test-driving a sample pair of contacts with his new prescription and will be returning to the optometrist on Friday to order a month’s worth if the optometrist believes they’re testing out well. James and I are also both making our semi-annual pilgrimage to the dentist for routine cleanings. I’ll be looking for anything pregnancy-related as well on this visit and I believe James is looking to get a referral to have his wisdom teeth removed sometime this spring/summer. I had mine removed last summer, so its his turn now! After this week, we’ll have a quiet month in April, with just one routine prenatal appointment at the OBGYN/Midwifery clinic down the street. Even though the health appointments are coming to an end, we’re entering a busy Spring season of nonstop fun! Throughout the months of March and April, we’ll be updating you on adventures at Sakura Con, attending our very first caucus to vote in the primaries, as well as April events of a Hatsune Miku concert and trip to Minneapolis, Minnesota! It should be a lot of fun and we’re looking forward to bringing bump along with us during our adventures. 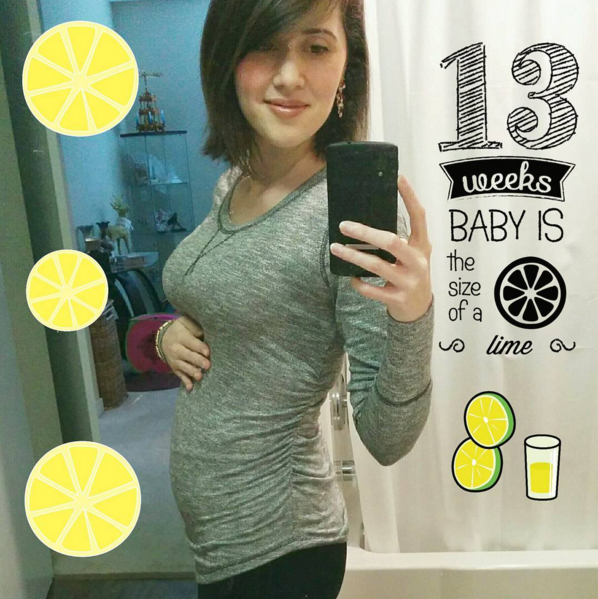 ← Big Announcement, First Appointments & Ultrasound!